Hello! 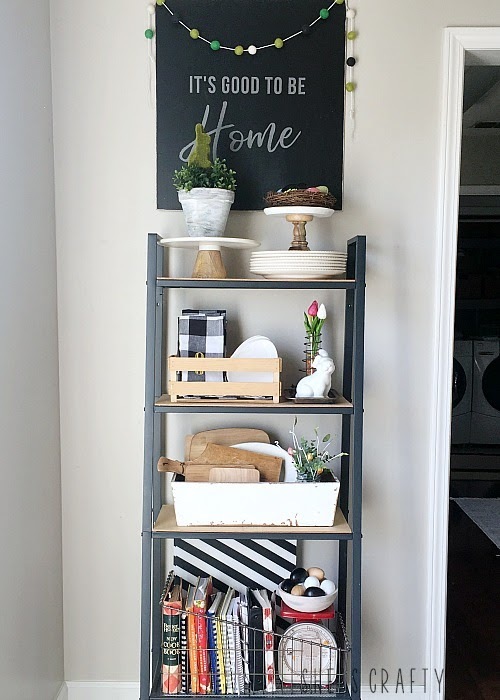 Come on in and take a tour of my home decorated for Spring. 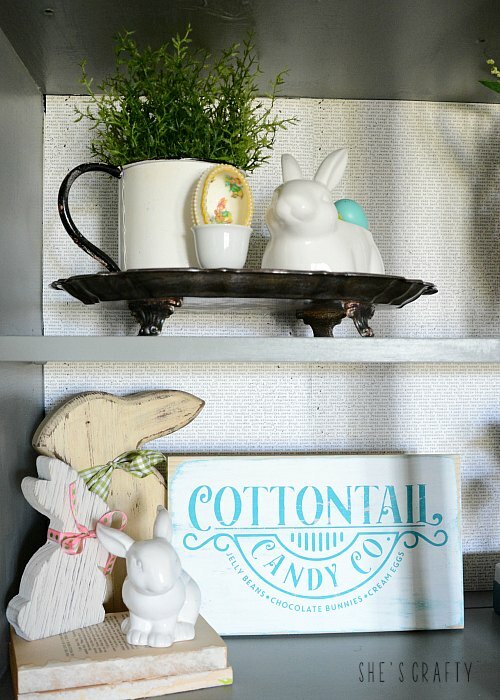 I have all sorts of Easter, farmhouse and vintage vignettes ready to share with you! My family and I have lived in our home in Tennessee for almost 15 years! We've loved this little home! We've done quite a few updates, but of course, there's always more to be done. Never the less, I believe that we should love our houses no matter how imperfect they are and create beautiful and comfortable spaces. One way I do that is by decorating the nooks and crannies of this home with holiday touches! 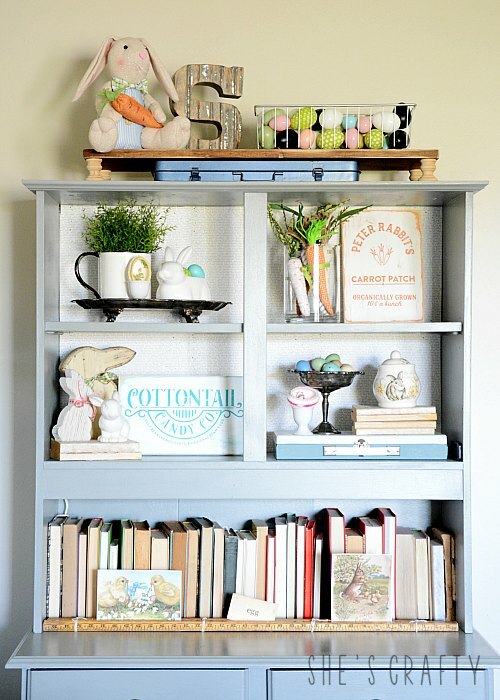 First up- our gray cabinet with many Farmhouse, Easter and Vintage Vignettes. 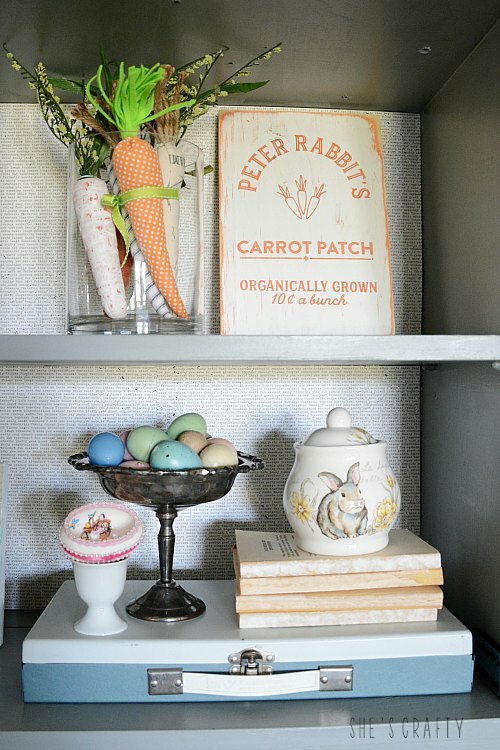 I hauled my Easter tote out of the attic and carefully placed bunnies and eggs in various vignettes. One of my favorite tips is to use scrapbook paper to change out the background of the cabinet. 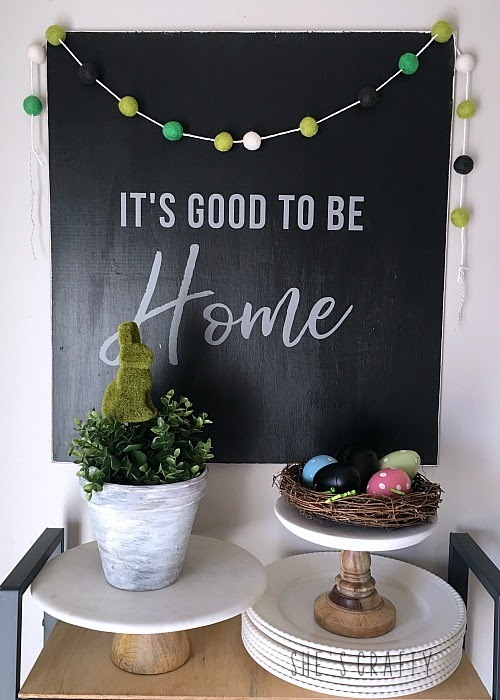 This vignette is bright colors, ceramic bunnies that have been collected from the thrift store, Target and Hobby Lobby, faux eggs that I painted to match my decor (along with chalkboard eggs and white plastic eggs) and a faux plant and enamelware mug from Hobby Lobby make up most of this decor! I tucked a vintage egg flash card and reproduction Easter cards into my vintage ruler photo holder. I received a few handmade carrots from a friend and made a wooden sign to accompany it. I downloaded the design from the Silhouette store and used this tutorial to make the sign. 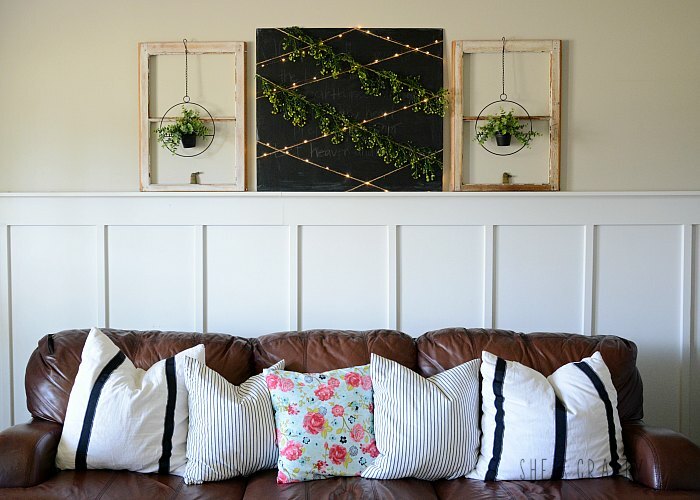 Above the board and batten in my living room I made a faux trellis, patterned loosely after this amazing display. I criss-crossed twine on a chalk painted board. Then I covered some of the twine with vines and some with fairy lights that are remote controlled. Our couch holds various pillows that I made covers for. The thin striped covers and feather pillows are from IKEA. 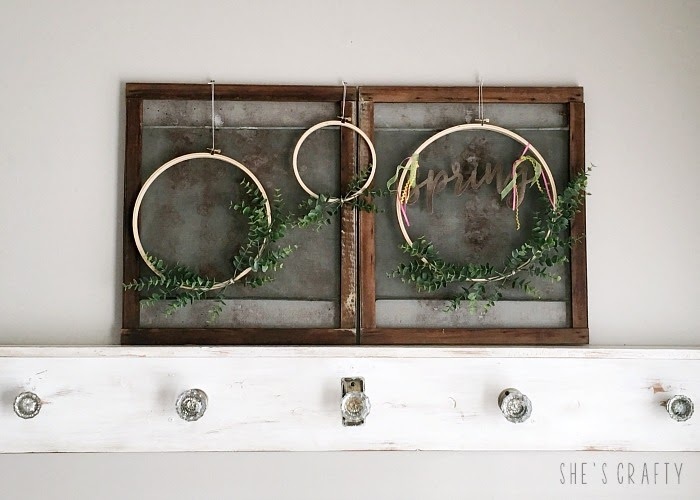 The hanging plant holders (similar here) make the perfect adornment to the vintage windows. I stuck some spare stems into the pots. 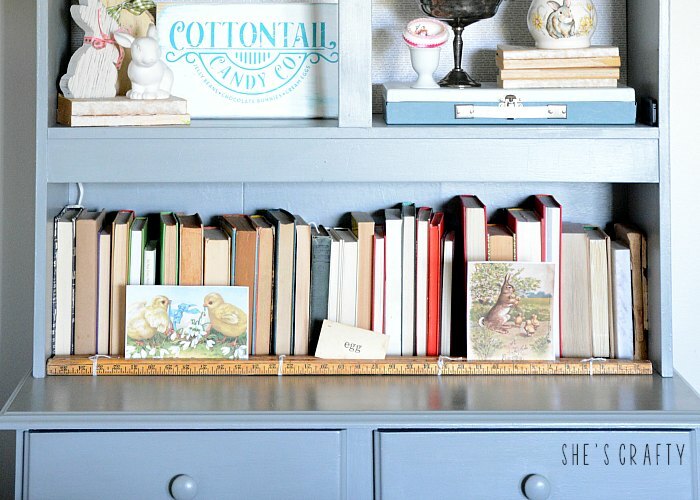 This little vignette is all sorts of vintage love! From the shutters to the books and the table, there's lots of history and patina in these pieces. 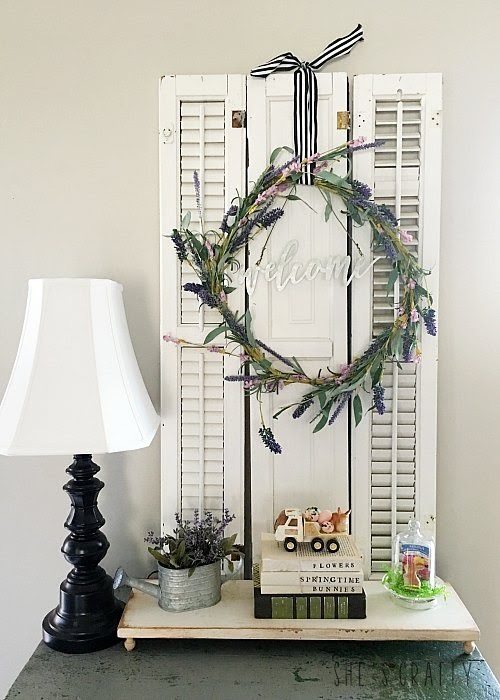 See the lavender wreath tutorial here. The truck was my husband's when he was a little boy. I filled it with mini eggs and a mini bunny. I stamped some words on cover less books. 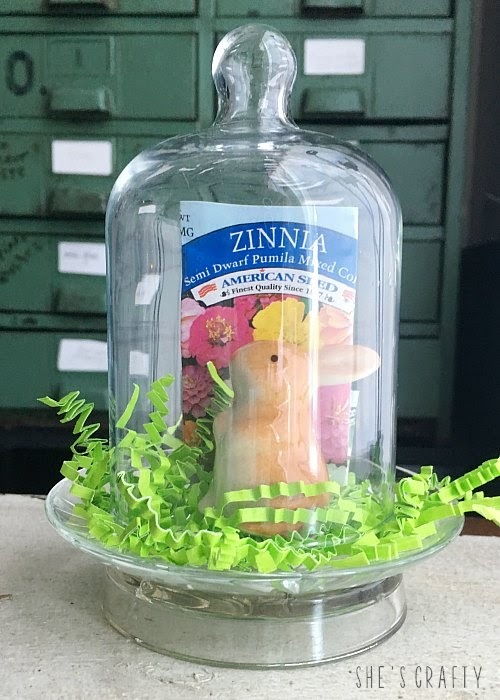 The little DIY cloche is holding another mini bunny, a seed packet and some colorful shred. Very Springy! And last but not least in the tour is our dining room and kitchen. Our dining room holds our mantel which I kept very simple. The background is vintage screen windows. I made embroidery hoop wreaths to hang in front. 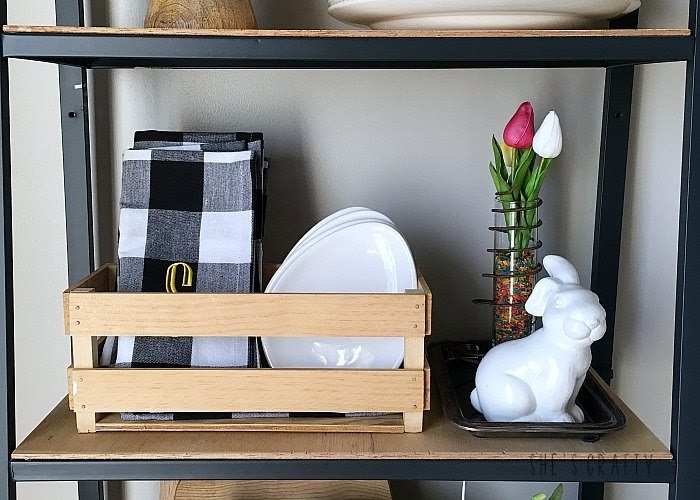 Our farmhouse shelving unit holds lots of special holiday pieces. The cute buffalo check napkins are from my sweet Sister in Law. They are in a crate with some egg shaped plates. A ceramic bunny is keeping watch over the room. Behind the bunny is a spring holding a vase with mixed up rainbow rice and faux but super real looking tulips. The next shelf down holds my collection of wooden cutting boards. 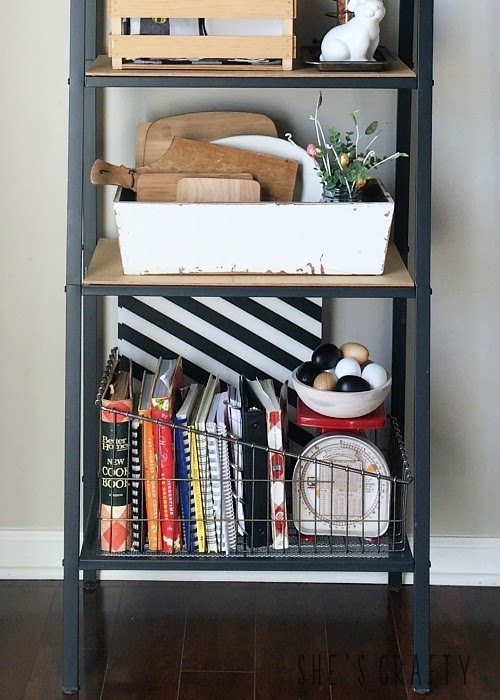 The bottom shelf holds my collection of cookbooks (the Better Homes and Gardens Cookbook is a classic) along with a vintage scale and a bowl of eggs. The top shelf has dishes, cake plates, a grapevine nest with eggs, a plant from IKEA holding a moss bunny plant pic. The sign is made similar to this one. 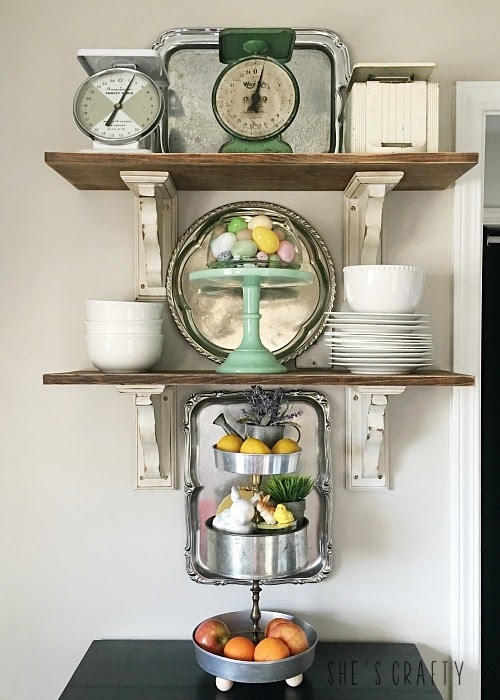 Our farmhouse shelves in the kitchen hold my collection of vintage scales and silver platters. (I obviously have quite a few collections) I used a jade cake plate to hold a glass bowl of faux eggs. Below is my 3 tiered tray stand. Thank you for sticking with me on my Spring Home Tour! 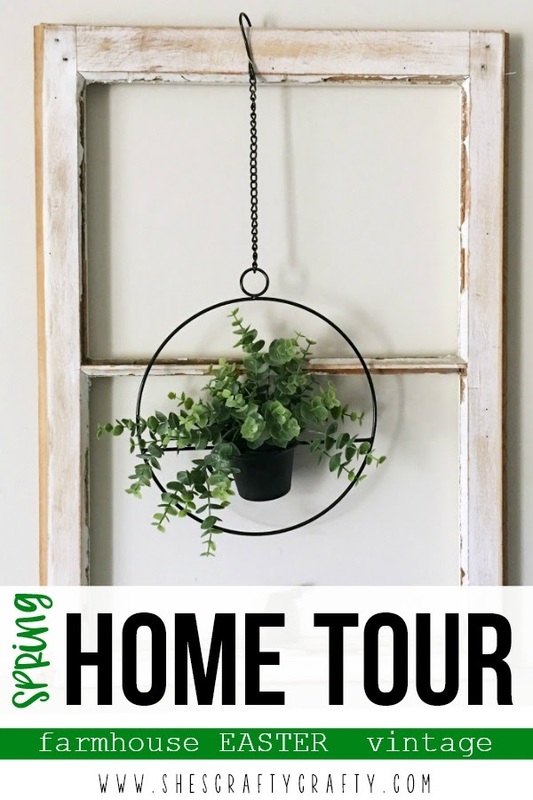 I hope you enjoyed it and maybe got some inspiration for your home. Remember, decorating the home you have shows love and creates comfortable spaces for you and your family! Thanks so much Alex! It was really fun and easy to make! 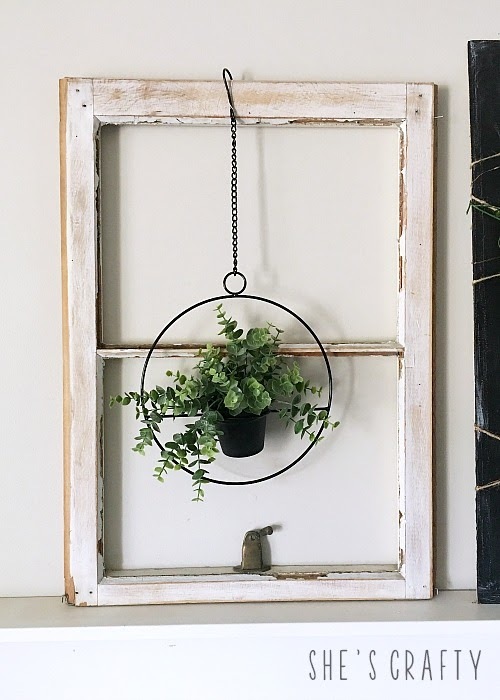 I lobe that hanging plant potter frame....super cute! Thank you Tayler! That's one of my favorite things too! 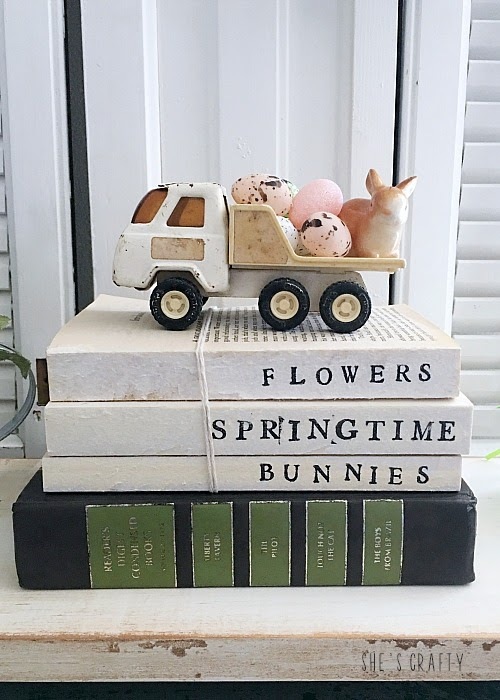 I love your spring vignettes. Thank you so much Kippi! Happy Spring to you as well! Candace, you have so many lovely vignettes. 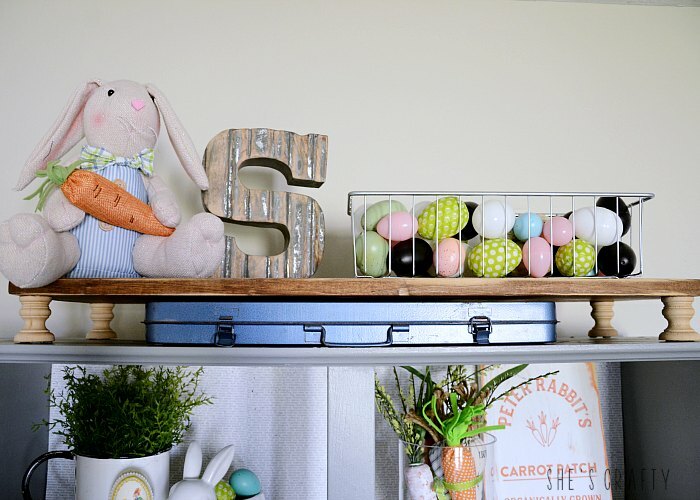 Love the details with the farmhouse and Easter items. 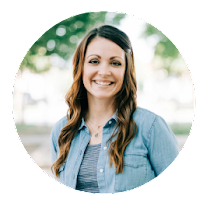 Thank you for sharing at Happiness is Homemade Link Party. I enjoyed seeing your tour.